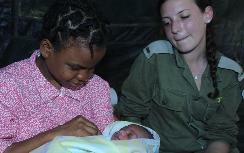 The IDF Field Hospital in Haiti has delivered its first baby, and the mother was so happy that she called him “Israel.” Mother and son are doing well. Gynecologist Dr. Shrir Dor, an IDF Major General, said that after the birth, the person who accompanied her “came to bless her, and said he thought the baby should be named ‘Israel.’ The mother was really happy so they named him that, as a way to remember the first baby that was born in the IDF Field Hospital." The hospital is the only one of its kind set up at the disaster area. The event was one of the happier occasions as rescue workers estimate that 200,000 people were killed in the earthquake that devastated the island nation. He said that the mother "gave birth, it was a normal delivery, a cute and healthy baby. Essentially, everything went well."